You have to hand it to Miggs Burroughs. The Westport artist — whose long career includes Time magazine covers, a US postage stamp, and pro bono work for every local organization that ever existed — has just completed a compelling new project. Like many of us, Miggs is fascinated by signers — the men and women who use American Sign Language to interpret speeches for hearing-impaired people. He’s amazed by their speed, as well as the variety and movements they make with their hands. 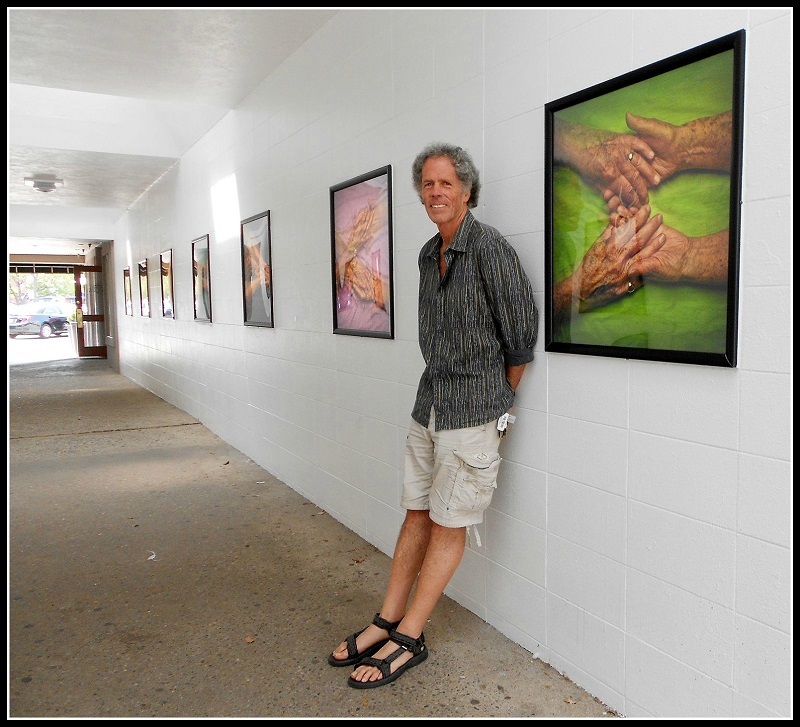 Three years ago, he created the “Tunnel Vision” exhibit that enlivens the pedestrian walkway between Main Street and Parker Harding Plaza. With his specialty — lenticular photography — Miggs used Westporters’ hands to show a variety of Westporters’ experiences. The photos change dramatically, depending on where you stand. Miggs Burroughs, in his “Tunnel Vision” creation. As he thought about the ASL signers, he realized that by slowing down their movements, he could use lenticular photos to portray their grace and beauty. Online, he found an ASL dictionary. Users type in a word; up pops a video of its sign. As Miggs watched in slow motion, his idea took shape. Meanwhile, America’s political climate was heating up. Miggs wondered how local artists would react. He’s always believed creative folks do what they can — however they can — to make the world a better place. Miggs turned the focus of his new project toward finding a poem of manageable length. He doesn’t read a lot of poetry. But when his son attended Hampshire College, he lived across from Emily Dickinson’s house. Miggs found a poem of hers, called “Signs of Compassion. The title is perfect. Miggs planned to photograph a teenage girl — fellow artist Nina Bentley’s granddaughter — signing the entire poem. But Chris Timmons of the Westport Library — where Miggs serves as artist-in-residence — suggested using a variety of people in town. Miggs mined his many contacts to find models. Nearly everyone he asked said yes. The 30 photos he used include whites, blacks and Asians. There are young Westporters, and old. First Selectman Jim Marpe is one model. I’m another. How did we know what to do? Noah Steinman — then a WAC staffer, now at the Aldrich — knows ASL. Miggs used his iPhone to film Noah signing the poem, while explaining each motion. Miggs then broke every one into 2 distinct gestures. He photographed each model doing both gestures. Under every photo is Dickinson’s poem, with that particular word or phrase highlighted. In its silence, it speaks volumes.